Lay out your blanket, unroll your butcher paper, unwrap your spread and enjoy a Picnic in the Park! Arrive as a character from your favorite Film, celebrate the 80’s, the Naughties and so many more and arrive in Style! The Prize for Best Dressed is a hot Air Balloon Safari for Two! **Voting took place on Facebook. ***The event is open to all ages. The event will consist of a themed Picnic, with activities, Food Vendors and The #PiP Bar. Just bring yourself and a picnic basket, or purchase from our vendors and sit back, relax and enjoy a day in the Park! 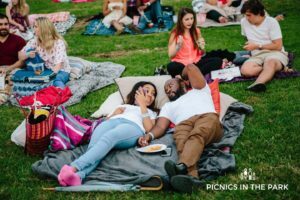 The “Picnics in the Park” Series is a compilation of themed picnics, held annually, aimed at communities and families. Each event is designed to provide a multi-sensory day by utilising the five senses of sight, sound, taste, smell and touch, therefor delivering a more memorable and creative experience for event attendees.